Potatoes cooked with lemon thyme will accompany the caramelized duck to perfection. A lovely way to finish the Summer or to welcome Autumn. 1 tbsp olive oil Line a large dish with olive oiled parchment paper. 2 tbsps of Acacia honey Brush both sides of the duck cutlets with the Acacia honey. Ground pepper : black, green and pink, salt Sprinkle with salt and pepper. 3 Mission figs Slice the figs about 4 mm thick. 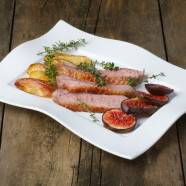 Oven temperature / 200 C – 18 minutes Half way through the cooking time, baste the duck with pan juices, and spread the sliced figs around the duck breasts. Return to oven to finish baking. Remove from oven, slice the duck breasts lengthwise in 6 mm slices, add the pan juices and arrange the caramelized fig slices around the duck. The meat will be very tender, juicy and pink, the skin will be crusty and delicious and the figs will compliment both beautifully.